SEOUL, May 24 (Yonhap) -- South Korea's three mobile carriers are expected to adopt a usage-based fee system for their upcoming super-high speed network service in a bid to help increase sales, a report said Thursday. The Ministry of Science and ICT and the carriers -- SK Telecom Co., KT Corp. and LG Uplus Inc. -- plan to start commercial operations of the so-called fifth-generation (5G) mobile network in 2019, whose data transmission speed is 40-50 times faster than the existing 4G network or long-term evolution (LTE). The report from Hana Financial Investment Co. said the mobile carriers will likely choose a fee plan that charges subscribers based on their usage of services, instead of flat-rate pricing, in order to hike sales to cover big initial investments. Usage-based pricing is predicted to sharply increase the mobile carriers' average revenue per user (ARPU), a key indicator of profitability, thanks to the increase use of high-volume content, such as ultra high definition (UHD) and holograms, it said. "There is a high possibility that mobile carriers may change their current high definition content into UHD or virtual reality, which will inevitably lead to an increase in traffic and jack up their sales sharply," said Kim Hong-sik, an analyst at Hana Financial Investment. 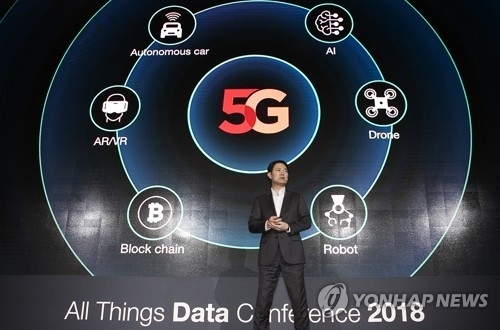 South Korea is poised to hold the first auction for 5G network frequencies in June, a move that could speed up the commercialization of 5G technology. The mobile carriers are expected to pay a combined 4 trillion won (US$3.7 billion) for the 3.5 GHz wavelength, which can provide better service at longer distances. This allows fewer relay stations to be built when setting up a nationwide network. In a separate report released Wednesday, Hana Financial Investment said the mobile carriers are expected to bask in improved profitability after 2020 thanks to the introduction of the 5G network. The combined operating income of the carriers is estimated to reach 6.2 trillion won in 2021, up 70 percent from this year's estimate of 3.7 trillion won, it said. The forecast presumes that their sales would increase at an annual rate of 20 percent, which they enjoyed thanks to the LTE service between 2012-17. Industry watchers, meanwhile, said it is still early to predict that the commercialization of the 5G service will result in an increase in the cost burden for mobile phone users, saying there is a low possibility of drastic changes in pricing.